FOS is not a club and there isn't anything you can actually join. 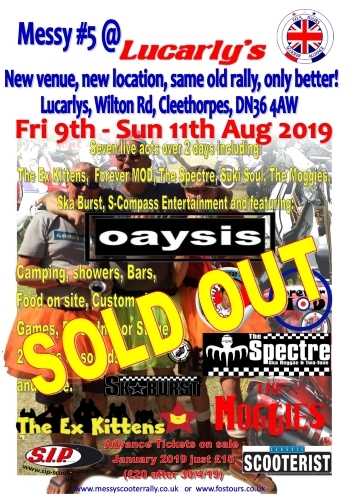 We are a collection of scooterists from Lincolnshire, Humberside and further afield who like to get together and have fun. We ride at the pace of the slowest, are never in a race or fighting any kind of point scoring battles and we only ever go near pasting tables when we are actually decorating! With The FOS it's all about the scooters, the music, great company and above all enjoying yourself. We organise one international trip each year, our own scooter rally and other events as and when we can. 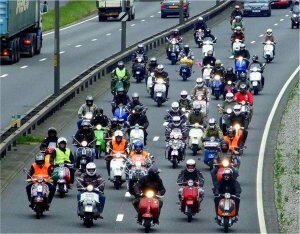 We meet up weekly on Wednesday evenings for local ride-outs and plan trips to various scooter events during the year. Messy #5 tickets are all sold. The event is a complete sell-out, so if you haven't bought tickets already, it's now too late. You can't pay on the gate and without a ticket you can't get a wristband. Check out the Messy # 5 page for event line-up and approximate timings.